Having arrived at La Selva Biological Reserve about 9 AM I had all day to enjoy the birds, monkeys, butterflies and even some bats that I found on a porch ceiling. I had been told it's very hot and humid on the Caribbean side of the country. Maybe I'm not close enough to the coast since it was pretty mild all day, except for when I was hauling my luggage from the first cabin to another. That will be the extent of any aerobic exercise until I have to haul my bags up to the reception area for departure, but I'll get a lot of slow walking in. 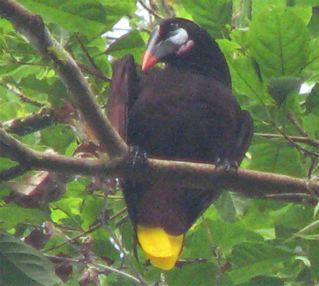 My favorite bird today was the Montezuma Oropendola since I got to watch through binoculars for a closeup view. It's a bird we saw on our first visit to Costa Rica. The wonder of it is that it has a broad gold tail (oro meaning gold in Spanish) and sings a very melodious chorus while it drops forward while flipping it's gold tail upward. To return to sitting position it needs a bit of help from its wings. I'm determined to get a video of the "dance" while I am here. They seem to enjoy the more open areas, so I've got a chance. On my way to lunch, I spotted a Scarlet-rumped Tanager and his bride near the dining hall. It's a great place to view hummingbirds. Lunch was marvelous! They have a board which tells you what's for lunch and dinner each day. Meals are served in the dining hall which seems to be the only truly hot area I've found so far. Most likely the heat from the kitchen doesn't help and the fact that it's mostly in the sun. There was a huge platter of fruit (papaya, watermelon, tangerines and pineapple) so I knew right then I was going to enjoy meals! They had another platter of salad, and then the hot section. I didn't think I could eat another black bean, but with all the fruit on my plate, I opted for some to complete the protein of the rice that I also had. Black beans and rice are typical Tico fare and when you're a vegetarian, it comes with the territory. They also had Tortas Papas (papas are potatoes). Coming from a German background, I love potatoes. The enormity of some of the trees is astounding. 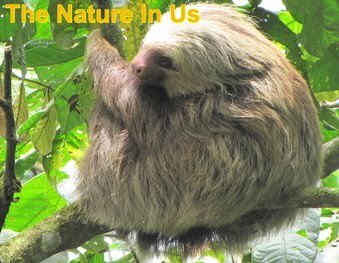 They are heavily buttressed which provides cavities for all kinds of wildlife. To see the density of the forest is a true wonder. Looking at a bird or butterfly guide book always makes me realize the creativity of the Creator, but to see so many plants is simply more than the brain can comprehend. Photographs never do justice. There are researchers all over the place and workers too. They hire the locals who obviously do a terrific job of keeping the grounds around the labs, library and work centers trimmed. No snakes there. There are concrete paths in these areas also which is rather nice. Not that snakes care about what they're crawling on. For a jungle biological station that has been around since the 50's, it's been well maintained. It may be rustic but it's very clean and kept freshly painted. I've seen cleaning people with brooms cleaning out the corners of the roofs over the porches. I'm impressed being partial to clean surroundings. I came prepared for mosquitoes but didn't find any day or evening early evening when I went to dinner. Maybe because of the immense amount of bats and birds, they're kept in check. Sounds great to me since I don't like to put on bug repellant even though I use natural essential oils. What doesn't smell good to bugs, doesn't smell good to me either. Dinner didn't take a back seat to lunch. Another great salad (they use a lot of shredded cabbage with cilantro, lettuce and assorted veggies to make the salads) and spaghetti. The sauce was delicious and the bread was made with pimentos and a bit of cheese inside. They had brownies for dessert. I haven't seen dessert mentioned anywhere in the 25 days I'd been in Costa Rica and it wasn't served at my homestay. Ticos are not known for sweet. Even the pastries at the bakery are dry and definitely not sweet. Refreshing from the sickening sweet that most people are used to. They get a lot of international people here used to desserts, so it's nice to have the option to treat myself when something appears that looks good. I gave up chocolate over 9 years ago, so I didn't have the brownies. The real excitement began when I left the dining hall. It was dark and my first thought was, "Will I be able to find my cabin in the dark?" I quickly answered, "Yes" and moved along the path. I saw the flashlight of somebody else coming across the suspended bridge and then noticed all kinds of flashes of lights along the sides of it also. Knowing the bridge is pretty high from the ground and very high above the river, it puzzled me and kept my interest so much that I had forgotten to use my flashlight to watch where I was walking. It didn't take long to realize they were lightning bugs. But like the plants and most bugs in the jungle, they must be huge to put off that much light. It was enchanting walking across the bridge with "twinkle lights" and I again thought of my friend who has a fear of bridges. I imagined the light show was for her to enjoy the walk across. At the end of the bridge I turned on my light to make sure my path was clear but I heard something in the brush. Although I go goo-goo over any animal, it's a bit unnerving to hear something so close and not be able to see it, wondering whether you really want to shine that light or just freeze and pray. Before I left my room for dinner, I had heard what sounded like a big cat howling a few times. They have pumas, jaguars, ocelots, etc. here but I could have been letting my imagination get away from me ... as I did for those first few moments when I heard the noise. 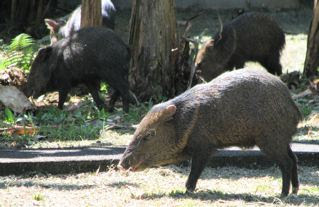 I chose to flash the light in that direction and saw a peccary, which is defined as a "gregarious piglike mammal found from southwest U.S. to Paraguay." I wouldn't have known what it was if I hadn't seen a peccary at ZooAve a few days ago. There was another little one following behind so I was totally delighted for the encounter! Another 20 feet and I was at the doorway to my room. 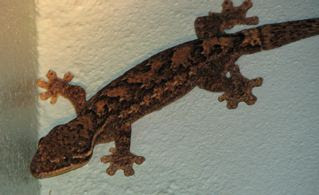 As I flashed the light inside the hallway, so I wouldn't open my door to an overnight visitor, I saw a chunky gecko on the stairs. That's when I discovered that my camera would do really great with night shots if I illuminated the subject with my flashlight. I also discovered later that the gap under my door is only an overpass to bugs, spiders and other small creeping things. The nearby private bathroom was quite the problem once it got dark. I had to unlock my door with a key to get out and to get back in since it locks automatically. I can't leave it open since I don't want anything to walk or climb in. I have an extra bed but I'm not willing to share yet. I'll be drinking all my water in during the day to avoid the nighttime journeys. Not knowing what many of these bugs are made me a bit wary of going to bed, but droopy eyes led me there. My brain wasn't as ready to sleep as it diagnosed the sounds outside. Something leaping onto another tree limb. Monkeys sleep at night. What could it be? The chorus that sang me to sleep was much different than the one in the city. I can't describe the different sounds but it was heaven to my ears, except for those bugs hitting against the screen that sounded like they were the size of a bird. Oh well, it is the jungle!